Chillicothe's Junior Defensive Back DeEll Midgyett was full throttle when he lowered his shoulder pads and drove a Richmond Spartan runner into the Hornets sideline. Midgyett's tackle was so vicious, his black helmet with the giant C on the side went flying and landed five yards down field. 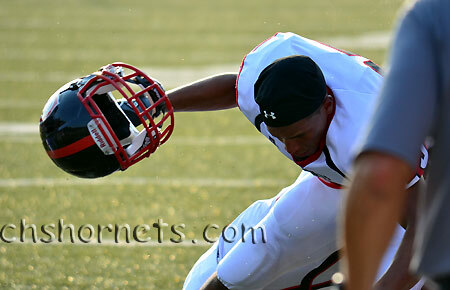 It was an early indication that the Hornets came to play football in this Jamboree, and came to hit hard. Sure it was just a Jamboree, sure it meant nothing in the regular season. But to the men wearing the red and black, this was an opportunity to make an early season statement. And Coach Phil Willard liked what he saw out of his players. Willard was especially pleased with his defense which shut out a Richmond team that lit up the Hornets in a summer 7-on-7 passing league and shut out the host Knob Noster team, allowing them only one first down and that on the last play of the game. The Hornet coaches felt this was one of Chillicothe's better Jamboree performances in recent years. Willard praised his team for being more physical, delivering the big hits and a defense that flew to the football. He also liked his team's execution on offense. While things went well for the most part, the Coaches did see some things that will need addressing including some confusion on defensive assignments, and a few bumps on offense including some penalties, one of which was on a beautiful on target pass play from Tyler Clampitt to newcomer Corbin Valdez at the two yard line. Valdez made it to the end zone untouched but was called back after a penalty at the line of scrimmage. The Hornets also had trouble hanging on to the ball at times including an interception and two fumbles all in the JV game against Smithville, who went 3-0 in the jamboree. But, for a program that hasn't had a winning season since 2009, hopes are high for the mixture of returning starters and new upcoming talent. Even better news was the Hornets came out virtually unscathed. A minor cut below the lower lip of one player appeared to be the only injury in the contest. Chillicothe will open their season Friday at Marshall. The Hornets are looking to avenge a one point loss to the Owls last year in the first game ever played at the New Jerry Litton Memorial Stadium. The Aug 30th game at Marshall kicks off at 7:00pm.